It was known as Rivoli's hummingbird named for the Duke of Rivoli about 1929 until the 1980s when it was renamed, obviously for its gorgeous looks. The Magnificent, along with his relative the Blue-throated hummingbird, are not only two of the most attractive, but the largest of the species. MALE COLORING: The male lives up to his name; he has a dark to bright turquoise gorget, violet purple crown and a vivid white triangle behind his eyes. His breast is black, his back is green and his notched tail is a bronzey-green. The juvenile mail has patchy black feathers that will make him appear like he has scales and has a greenish hue to his underbelly. FEMALE COLORING: Nature has deemed to make the female less magnificent in coloring; instead of bright turquoise, her throat is a medium grey with deep green back and tail. 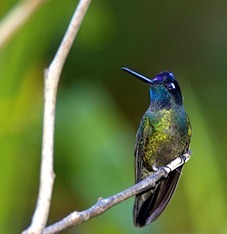 SIZE: The second largest hummer north of Mexico, this bird is about 5 ¼ inches with a wingspan of about 7 inches. BILL: The bill is very long and black. It has a slight curve to it. TAIL: The Magnificent hummer has a long bluish-black tail. The Magnificent hummingbird winters in Mexico and a few remain as permanent residents of Arizona. They can be seen in Arizona, New Mexico, Texas, Mexico and Costa Rica. There have been rare sightings as north as Colorado, what I refer to as "uncommon migrants". They love conifer forests, oak woodlands and mountain canyons. They nest in late spring through the summer and prefer humid montane forests. They are experiencing some habitat destruction in Mexico and Central America.By providing them with nectar-producing flowers and nectar filled feeders, we can help sustain the population by assuring they have a sanctuary to come to when they migrate. Good food, fresh water, a nice perch- space with some shade, and you may even be rewarded with a nest with some babies! Make sure you have your camera and/or video recorder at hand and ready to go if you are one of the lucky ones whose sanctuary becomes a nursery! This is a colorful, beautiful and highly aggressive hummingbird. They are very defensive of their breeding grounds and territories. As a larger hummer, they fly a little slower than the tinier ones and sometimes can be seen gliding on set wings. This is also a high altitude bird who eats lots of insects in addition to his diet of nectar. Flocks of hummingbirds, whether Magnificent or other species can be referred to as bouquets, glitterings, hovers, shimmers and tunes.